At the tail end of my month of manic travelling, I was in Dublin this weekend visiting one of my oldest school friends. What with it being St Patrick’s day eve and Ireland doing something pretty great at the rugby (or so I’ve heard), Dublin was a sea of people. And I mean that literally: everyone you saw was in green. And 90% of those people were wearing leprechaun hats. As such, locating the stylish locals in amongst the mass of green tourists proved somewhat difficult, so you can imagine my delight when I found these two. After toddlers dressed like grown ups (sounds a lot weirder and less adorable than it is), my absolute favourite fashion related thing is when two people with polar opposite taste are photographed together. As I clearly can’t go round taking photographs of 2 year olds on my iPhone, I am always on the look out for the latter. 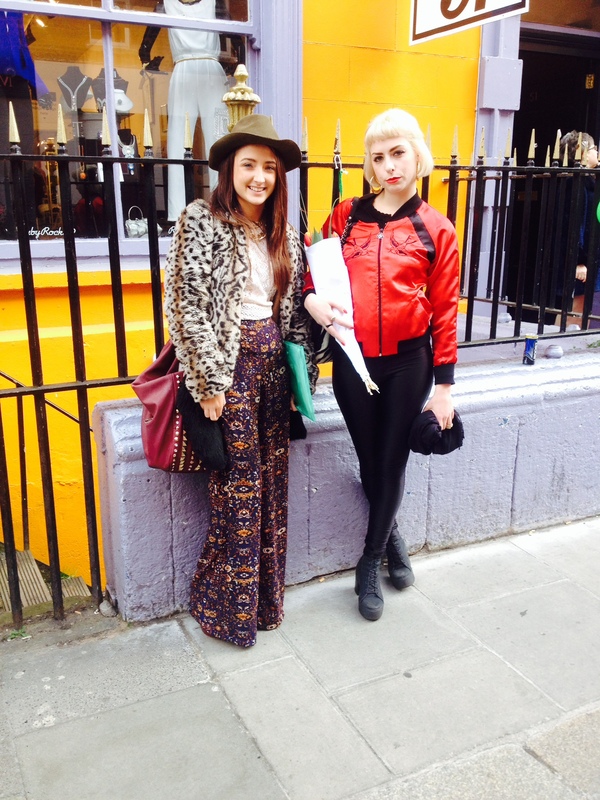 Seeing Sarah-Ann and Anna then was one of my street-style dreams come true. I caught sight of Anna’s amazing Pink Lady style red jacket and platinum blonde hair first, and then saw how amazingly she contrasted with her friend, who is definitive proof that there is no such thing as ‘clashing patterns’. I just love how they are at complete opposite ends of the sartorial spectrum and yet they look so great standing next to each other. It was certainly a bright spot in the sea of green. I read this article and found it very interesting, thought it might be something for you. The article is called Irish Charm – #streetstyle and is located at http://prancingthroughlife.com/2014/03/18/irish-charm-streetstyle/.